I've been reading a lot of messages on the forum and thought it was time to finally join this group of port passionates! I catched the virus many years ago and started collecting port since about 2 years and hope to get some good information on this forum. For the interested: I am Belgian living in Holland. great to have you on board. 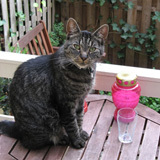 Don't know if you know any of a our Dutch guys but one of them had a wonderful cat called Dries. Errrrmm... not sure if this is appropriate but it is at least factual. Welcome to the site. Feel free to ask any questions you want and we can all do our best to answer you. That would be the cat in the picture. Welcome to TPF Dries! Where are you located? LadyR and I don't come to Holland often these days, but when we do, we always make sure to organise an offline in our hometown, Utrecht. I'm from Rosmalen (Den Bosch). Funny, I'm actually meeting some guys from Oman tomorrow (Petroleum Development Oman). That's where my wife works as well (through Shell). The first tpf offline in oman? mmm the possibilities.